Below is a summary report about the Congress from the Lausanne Committee for World Evangelization. Our Lausanne board will be meeting in January to develop more specific plans. The Third Lausanne Congress on World Evangelization closed October 26 in Cape Town, South Africa, with a ringing call to the Church. This Congress, perhaps the widest and most diverse gathering of Christians ever held in the history of the Church, drew 4,000 selected participants from 198 nations. Organizers extended its reach into over 650 GlobaLink sites in 91 countries and drew 100,000 unique visits to its web site from 185 countries during the week of the Congress. The Cape Town Commitment, a declaration of belief and a call to action, will stand in the historic tradition of The Lausanne Covenant, which was issued from the 1974 Congress, held in Lausanne, Switzerland. The Lausanne Covenant became widely-regarded as one of the most significant documents in recent church history. The Lausanne Movement, since its founding by U.S. evangelist Billy Graham, has worked to strengthen evangelical belief, and to reawaken the evangelical church’s responsibility in God’s world. The Cape Town Commitment is therefore in two parts. The first part, a Trinitarian statement, fashioned in the language of love, is the fruit of discussion by senior evangelical theologians drawn from all continents. This is available now on the Lausanne web site, www.lausanne.org. The consequent call to action, shaped from discussion at the Congress around critical issues facing the Church over the next 10 years, will be completed by December. It is expected to engage in principle with such issues from all parts of the world. Chris Wright, International director of Langham Partnership International (John Stott Ministries/USA) is chief architect. “We would like The Cape Town Commitment to be seen as ‘a gift to the local church from representatives of the global church,'” said Doug Birdsall, chairman of The Lausanne Movement. He then outlined the Board’s plans for the movement’s future: “First: to stay light on its feet, remaining agile in its ability to respond to new challenges and opportunities. Second, to be strong theologically, firmly rooted in Scripture and nourished by the best reflection on how we take the Word to the world. Third, to provide a reliable and credible contribution to Christian discussion and mission. Fourth, to keep a focus on identifying and developing younger leaders. And fifth, to be strategic in gathering the right people at the right times in the right places. “Lausanne gatherings will breathe oxygen into the fire that sparks more fires, and track progress made on the priorities established in Cape Town,” he said. Birdsall sketched out plans for a series of Davos-like gatherings, drawing thought leaders from the Church and from mission agencies, from government, business, and academia. The first is planned for June 2012. The Lausanne Movement is rooted globally under regional leadership around the world. The funding for the Congress had been raised from all regions, and from a “healthy combination” of significant major gifts and many smaller gifts, often sacrificially-given. The Congress extended to an estimated audience around the world of a further 100,000 people through its GlobaLink sites. It was also possible to participate virtually. Prior to the Congress, The Lausanne Movement launched a multi-lingual online Lausanne Global Conversation to begin the discussion process. This was complemented by a series of radio programs in countries in the Global South. The Global Conversation, the first of its kind, has gained significant momentum and will continue. A round-the-clock team mined the data of all responses throughout the Congress, despite the Congress web site being brought down for the first two days by malicious attacks. Cape Town 2010 was held in collaboration with the World Evangelical Alliance, which includes the National Association of Evangelicals, of which the Church of the Nazarene is a member. The Lausanne Movement is a worldwide movement that mobilizes evangelical leaders to collaborate for world evangelization. For more information, please go to www.lausanne.org. Just received a report that I’ve never before seen about our campus…..a vending machine report. For the first eight months of this year, we sold 26,000 drinks in our vending machines. The top choices……Aquafina, Dr. Pepper, Mountain Dew. During that same time, we sold 38,000 snacks. The top choices…..M&M Peanut, Snickers, Twix. The busiest machines……Irby Hall, followed by Wells/Robertson. The Brown Bottling Group provides our campus drink and snack services, and does a great job….while keeping our costs affordable for students. I’ve just returned from 12 days in Cape Town, South Africa, where I was attending the Lausanne Congress which brought together 4,300 evangelical leaders from 196 countries. It was a remarkable event, and a beautiful city. Made some new, and very exciting partnerships for Belhaven University. Will share them with you soon. During my 25 year involvement in the leadership of the Lausanne Movement, I’ve watched the Church globally shift from deep divisions, mistrust, and infighting, to this Congress, where there was demonstrated an overwhelming spirit of harmony, commitment to evangelism, and care for the needs of a suffering world. Many of the tensions of the past have been healed, and subsequently, there was a greater urgency than ever for the Gospel because of God’s people coming together to work in cooperation. The Congress was also a sobering reminder for the western Church that persecution of Christians continues with great intensity around the world, and the challenges are complex for the Gospel to reach through the structural barriers of mega-cities, oppressive governments, and class based economic systems. 240 speakers and presenters in plenary sessions and “multiplex sessions” all simultaneously interpretedion 8 languages—all edited, translated and broadcast to 643 sites within five hours of original presentation. No speaker was given more than 15 minutes to assure that many were heard and that collaborative learning took place in discussion groups. $16,500,000 – Congress budget (we had $800,000 yet to raise when I left for home). 3,660 Volunteers and Staff have worked on one aspect or another of the Congress preparations over the last three years. You need to make time to watch this 17 minute video on this history of the Church. It is the best I’ve seen summarizing the early days of the Church through the 1910 Edinburgh Conference that launched modern missions 100 years ago. Cape Town 2010 Opening Session – Turning Points, Part 1 from Lausanne Movement on Vimeo. Miner Shirts . . . For Sale? I’ve had so many notes back asking where you could buy one of those shirts, so I wrote my friend Steve Douglass, the president of Campus Crusade for Christ, and told him of your response to the post. I encouraged him to find a way to get them for sale, and you may want to watch the Campus Crusade for Christ web site to see if that happens. I’ll be with Steve on Sunday at a meeting and will talk to him then as well. A few minutes ago the last of the 33 miners was pulled from the Chilean mine where they have been a half-mile underground for over two months. A friend from Campus Crusade for Christ wrote me this afternoon to share how they supplied MP3’s of the Jesus Film to the miners and provided the shirts they are all wearing as they are rescued from the mine. 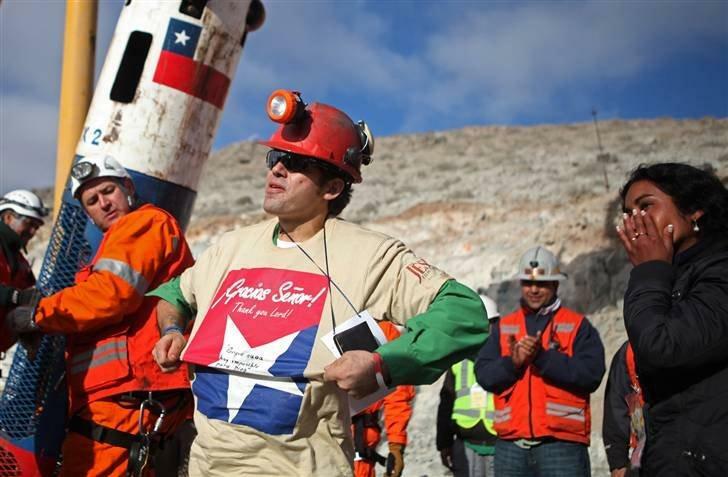 The shirts say, “Thank you God” and also printed on them was the favorite verse of the 9th miner rescued. Once above ground, he knelt and prayed. Here’s a photo of the tee shirt the miners are wearing. You can see the JESUS Film logo on the shirt sleeve as well. I want to share with you about the last two very intense weeks as we have worked on the project to take the Word of God and the JESUS audio version to the mine, but it has really be worth the effort as it is food for the soul. As Campus Crusade, God guided us to think about how we could help these men and this was how we took the initiative to contact some churches in the North, leaders and authorities about sending the JESUS audio into the mine. It wasn’t easy in the beginning because of some apathy in the Christian leadership and a lack of a sense of urgency, together with the restrictive control of the rescue team but God in His sovereignty provided that we were able to gain contact with the daughter and the brother of one of the three Christians that were trapped there. During several weeks, I was in contact with them, and I explored the possibility of sending them audio material. Finally, I traveled to the mine with 33 MP3’s containing the JESUS audio version and an ample portion of the Bible. I was there for 2 days and we sent the MP3’s through each family members that were there. The top 50 blogs for theatre lovers has been named, and Belhaven University is recognized as one of the top 10 blogs for theatre companies and academic departments. Here is the top 50 list. Here is our blog – it’s worth reading!